It is not uncommon for specific joints to cause debilitating pain, either due to acute injuries or chronic arthritis. As a pain-alleviating treatment to delay eventual surgery or to augment physical therapy, injections of local anesthetic and steroid may be performed into or around specific joints. At Spine & Orthopedic Center, facet joint injection procedure is performed in our in-office accredited sedation suite and our physicians can be seen in any of our locations in Boca Raton, Deerfield Beach, Coral Springs and Plantation. For inquiries, call us at 888-409-8006. Before the procedure, the physician numbs the skin and tissue above the facet joint with an injection of local anesthetic. Then, with the guidance of an x-ray device called fluoroscope, the physician guides a needle through the numbed tissue and into the facet joint. Contrast dye is injected into the joint to confirm the needle’s placement. Once the needle is positioned properly, the physician injects a soothing mixture of numbing anesthetic and anti-inflammatory steroid medication. One or more facet joints may be treated during the same procedure. If this causes the pain to subside, it suggests that the facet joint (or joints) injected were the cause of pain. 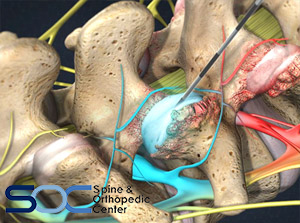 The back or neck pain may disappear immediately after a successful injection because of the administered anesthetic. As the anesthetic wears off, pain may return. The steroid will begin to take effect in the days after the injection. The steroid will reduce inflammation and pain. The facet joint injection can provide relief for a span ranging from several days to several months. Up to three injections may be given per year.